Product #1195 | SKU 468MG | 0.0 (no ratings yet) Thanks for your rating! Advanced ball head with hydraulic system for heavy loads. The Manfrotto 468MG series is designed to meet the demands of professional photographers who require a light weight head but at the same time want to support heavy camera loads up to 16kg. The 468MG uses a hydraulic system to lock the ball mechanism in place. Using hydraulics instead of a mechanical system produces a super-tight lock from a minimal turn of the locking knob, without sacrificing the smoothness of the ball's movement when unblocked. To keep weight low, the head is made of magnesium; and to provide smooth movements the 3cm aluminum ball is Teflon coated. The oversized ball locking knob allows for easy control even when using gloves. 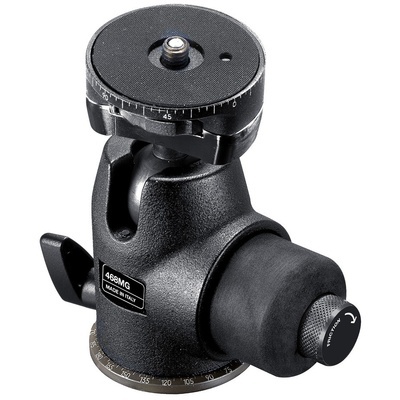 This head futher offers a range of handy features: independent pan and tilt locks with a 360° pan movement; +90/-90° tilt movement; a graduated engraved panoramic base; and a calibrated adjustable friction control on the main knob. The 468MG fixed attachment version has an easy-to-grip notched ring that turns the camera mounting retractable 1/4"-3/8" screw making it easier to mount your camera to the head.